The Baptism of the Holy Ghost has caused some to rely and be absolutely dependent upon the promptings of the Spirit for illumination and utterance; they think there is no need of searching the Scriptures and comparing passage with passage; that premeditation and systematic marshalling of facts and arguments are unnecessary: they maintain that they have only to open their mouth and the Lord will fill it. Undoubtedly the Lord has graciously and wonderfully met His messengers who desire to witness for Him, time after time, in their need, in order that they may be able to give a reason for the hope that is in them. To support their contention, the verses spoken by our Lord to His disciples are often quoted:-'But when they shall lead you, and deliver you up, take no thought beforehand what ye shall speak, neither do ye premeditate: but whatsoever shall be given you in that hour, that speak ye: for it is not ye that speak, but the Holy Ghost.' (Mark 13.11) They forget these words were given as a comforting exhortation for the days of severe persecution that would be experienced by the disciples after their Lord had ascended, when they would be delivered before councils, beaten out of synagogues, and brought before rulers and kings for His sake. There is a vast difference between those troubulous times and the time of religious toleration in which we live, when audiences of anxious and hungry souls are eager to hear the truth proclaimed in its fullness. 'The sword of the Lord and Gideon!' - but Gideon has to marshall his scriptural focus in orderly fashion, if he wishes the sword to be effectual, and the Lord to give him the victory. D.P. Williams wrote these words back in the early days of Pentecostalism, yet they still need to be reiterated today. For some reason, there are still some Pentecostals who are convinced that God is most glorified when we don't bother studying His word or preparing biblical sermons. It is deemed more spiritual to 'be absolutely dependant upon the promptings of the Spirit for illumination and utterance'. And, if there is no need for 'searching the Scriptures and comparing passage with passage ... premeditation and systematic marshalling of facts and arguments', there is certainly no need for seminary or Bible College. As a certain pentecostal pastor recently told a congregation: 'God is not glorified when someone has gone to Bible College and then teaches a good Bible study; God is glorified when someone who hasn't been taught preaches what the Holy Spirit gives him!' (He didn't say this in English, so I admit that the passing of time may have lent a somewhat 'dynamic equivalence' bent to my translation.) I was rather embarrassed; not least because I, a seminary lecturer, had just sat down from teaching a Bible study which the church had invited me to give. Sometimes such a method of neglecting the hard work of exegesis, theology and preparation seems to work for its practitioners. Yet D.P. Williams reminds us that apparent success does not imply God's approval of the method; rather, God is a God of grace despite our weaknesses and failings (and even if we have engaged in thorough study of His Word and careful preparation, we still need this grace, for we are still weak and failing!). D.P. Williams comments give me hope, for they remind me that, right from the very beginning, responsible pentecostals have always rejected such a negative attitude toward the study of Scripture. Right from the beginning responsible pentecostals have stressed the importance of thorough study of God's Word. Being pentecostal does not necessitate this attitude of scorn/suspicion toward Biblical study, careful Bible teaching, and theological training. On the contrary, I would argue that it is such figures as D.P. 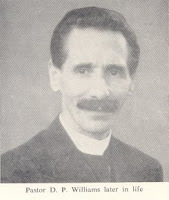 Williams who represent the true pentecostalism. 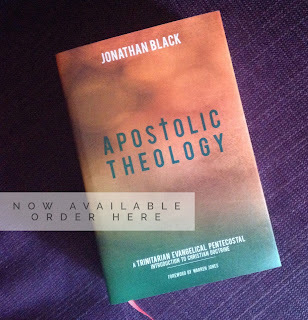 Pentecostal theology is not about separating Word and Spirit as some would have us believe. Rather the early history of Pentecostalism testifies to God working by His Holy Spirit through His Word - Word and Spirit together! The doctrine of the initial evidence of the baptism in the Holy Spirit was forged by asking the question 'what does the Bible teach?' 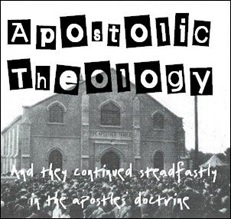 In the UK, the Apostolic Church came about through a desire to follow the Biblical pattern. The Apostolic Vision, which was so stressed in the early days, was not a vision of numbers or achievement (well, at least not human achievement), but rather a glorious vision of Christ that came straight from the pages of Scripture. True pentecostalism necessitates careful, in-depth study of Scripture, for it is only through such careful, in-depth study of God's Word that sound Pentecostal doctrine can be known. God has revealed Himself and His works to us in His written Word; if we neglect to thoroughly study what He has so graciously revealed, how does that reflect on our desire to know Him?